Review patient’s complete physical, symptom history and diagnostics images. Tailor our solutions to the patient’s schedule and specific needs. We only offer the most innovative diagnostic and interventional pain management techniques. Our only goal is to relieve our patient’s pain and return them to work and life sooner. Gabriele P. Jasper, M.D. was born into a medical family. His father is the noted physician, Philip Jasper, M.D., who has been practicing urology for over 50 years. His siblings (sister Josephine Jasper, M.D., brother Theodore F. Jasper, M.D., and sister-in-law Tiziana P. Jasper, M.D.) are all practicing physicians. His mother also went to medical school but decided to forfeit her profession as a medical doctor in order to raise her family. Fluent in Italian, the versatile Dr. Jasper began his extensive medical training at the Scientific Undergraduate School Of Malpighi in Bologna, Italy. He then attended medical school at the prestigious Universita’ Degli Studi Di Bologna (The University of Bologna). After formally returning to the United States, Dr. Jasper completed a preliminary Residency program in General Surgery and Trauma Surgery at Monmouth and Jersey Shore (South Central New Jersey’s Level One Trauma Center) Medical Centers respectively. He then broadened his medical perspective by completing a Residency program in Clinical Anesthesia at the University of Medicine and Dentistry of New Jersey, in Newark. During his Residency in Clinical Anesthesia, Dr. Jasper developed a high degree of interest in two highly specialized fields. His love of children drew him toward the difficult and precise science of Pediatric Anesthesia and his capacity for compassion created an interest to treat patients experiencing debilitating chronic pain. After attaining his Board Certification in Anesthesia and entering private practice, Dr. Jasper vigorously pursued both of these areas of interest within his specialty. While at Community Medical Center in Toms River, New Jersey, as an attending Anesthesiologist, he was chosen to handle the more complex pediatric cases along with a normal adult patient caseload. Because of his Residency in General and Trauma Surgery, Dr. Jasper also served as the First Assistant in General Surgery on an emergent basis. Having been interested in Pain Medicine since his first year of Anesthesia residency in 1993, Dr. Jasper decided to expand his practice in 1996. His subsequent involvement with the Center for Pain Management at Community Medical Center (Tom’s River, N.J.), lead to his total dedication to the science of Pain Medicine. Board certified in anesthesia, Dr. Jasper offers a unique educated perspective to each and every patient when he evaluates their pain. Dr. Jasper founded the Center for Pain Control in 2002. Based on word from satisfied patients and extensive M.D. 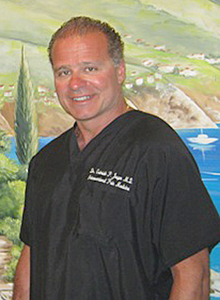 referrals, his practice has expanded to two “state-of-the-art” facilities in Brick and Milltown, NJ. The completion of the Jasper Ambulatory Surgical Center in 2009, a convenient cutting-edge annex to the Brick office, will allow patients to receive minimally invasive procedures in-house. In 2015 Dr. Gabriele P. Jasper became the recipient of the 2015 Parviz Kambin award in recognition and honor of his outstanding scientific and educational dedication to Transforaminal Surgery. He is now known as New Jersey’s leading pain physician due to his widespread reputation in the medical community here and abroad. This status was established by the various presentations of advanced minimally invasive procedures he has perfected and taught to fellow physicians. He has been trained and has in return trained physicians in the Orient, Europe, Hawaii, and across the USA on minimally invasive endoscopic (arthroscopic) spinal surgery.